I don't know if it is the winter like weather or what but I am having a really hard time getting into spring. I keep thinking it is the end of February, not the end of March. This week was technically the first week of spring so I thought we should do something springy to get us in the mood. Last week we went to play at my friend Anne's house, she is always making cool stuff with her daughter and this time she had a beautiful contact paper butterfly in her front window. We have done a fair amount of contact paper stuff at our house but we have always used paper (or accidentally glitter) but Anne used ribbon. Which not only looked awesome but seemed like a fun and easy kid/toddler material. 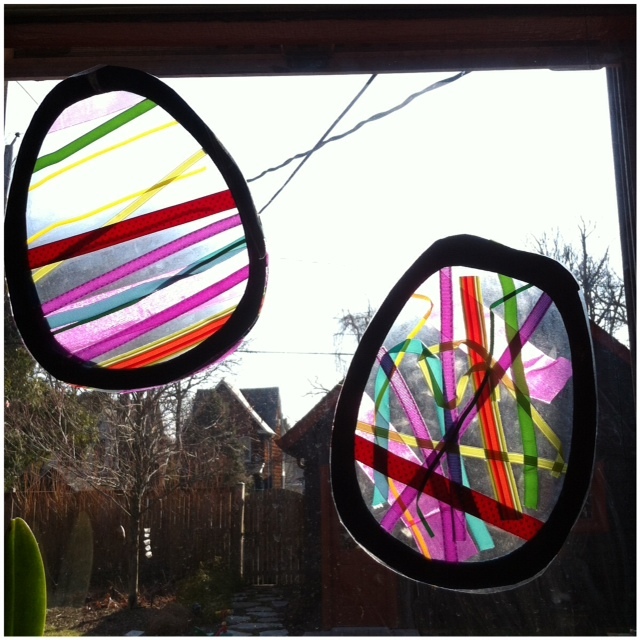 So inspired by Anne we used our overabundant ribbon collection this week to make eggs. I started by taping pieces of clear contact paper, sticky side up to the table. I then cut out four egg shapes from a piece of heavy construction paper. Next, I brought down our collection of ribbon and started cutting little strips. It was fascinating to me to see how the girls decided to put down their strips. The Bee who is usually the more particular of the two, put her ribbon down so it overlapped and went in all directions. The Bean, usually more of the rule breaker, neatly laid all her ribbon horizontally across her egg. They both loved using the ribbon and, honestly could have made several eggs each but I used the last of the contact paper on the two we made. Once they were done, I laid another construction paper egg cut out over the first and then covered them with another layer of contact paper, this time sticky side down. I then cut the eggs out and taped them up into the window above the kitchen table. The girls have loved looking at them and they look great when the sun shines through! They are just the springy decor we needed in our house, now if only the weather would follow along. Oh wow! We are so going to do this! Great idea! !